“Two Lives” (“Zwei Leben”, 2012), directed by Georg Maas and Judith Kaufmann, is interesting first because it is based on a novel unpublished at the time of filming. That is a manuscript by Hannelore Hippe, eventually published as “Ice Ages”, based loosely on real history, inspired by the discovery of a corpse in Bergen, Norway in 1990. So, if you’re novel is unpublished or “just” self-published, there’s hope. The main part of the drama is set right after the fall of the Berlin Wall in 1989. Katrine Evensen Myrdal, age around 50 (Julianne Kohler) lives an ordinary family life in Norway, married with daughter and grand-daughter, and elderly mother (Liv Ulhmann). A lawyer approaches her about her past, as one of the Lebensborn, or war children, conceived by occupying German soldiers during WWII with “Aryan” women intending to give the Fatherland more “superior” children. Many of these children were brought to what became East Germany. After WWII, the East German Statsi tried to use some if the kids as Communist spies. Katrine, however, had secretly escaped through Denmark, as shown in some flashbacks. The attorney involves here with litigation against the Norwegian government (parallel to “Woman in Gold”) that will lead to catastrophe for her family. The film has a couple of critical scenes involving auto crashes that are quite well done. In 1999, when visiting a gay bar called the “Connection Disco” in Berlin, I met a graduate student from England who said he had been born in East Germany but had “escaped”. The official site is here. The DVD is available from Netflix. 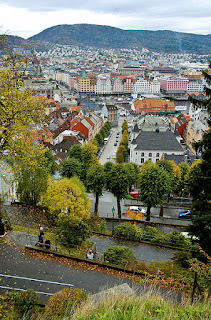 Wikipedia attribution link for Bergen, Norway picture, by Aqwis, by Creative Commons 3.0 share-alike license.